Marketing for Owners Podcast is where I give you little tips and tricks, obviously, many on marketing, but really, really really it is all about making your workload easier. 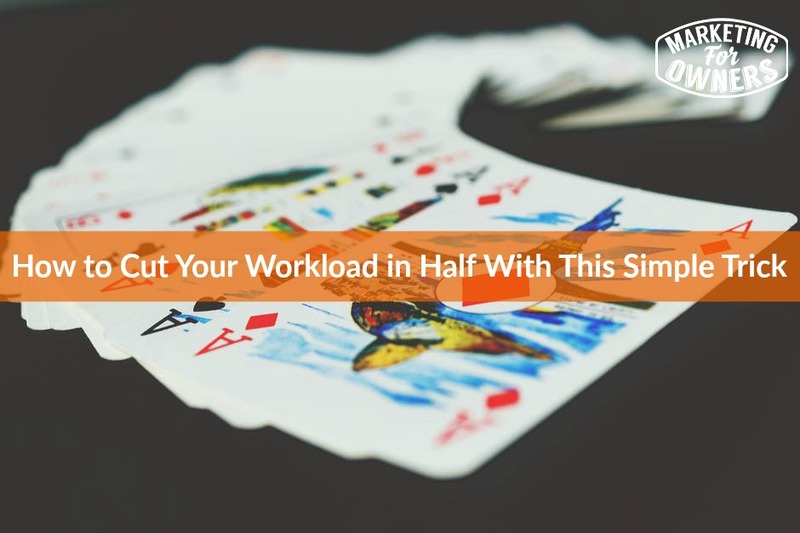 As you can tell from the title, how to cut your workload in half; then bang on topic. Now all these kind of things lead us to our club called The Owners Club. Now if you were to go visit theownersclub.co, you will find you actually have to pay to join, there is a free version, but to be honest all the good stuff is in theownersclub.co. It is twenty-nine pounds per month but once you arrive, once you join we guide you through a simple three section course. You can take as long as you want or you can do it as quickly as you want and you can certainly cover it all in less than a month and get your twenty-nine pounds worth; which is about thirty five dollars, by the way. It is foundation, then modernization, then growth. To be honest, I will leave you to find it and that has been recently updated, so if you have a looked before, you wouldn’t have seen that. It’s probably not even in the sales page details, or it might be by the time you listen to this, who knows? Why don’t you go look? It has got one hundred percent money back guarantee if you do, if you start. If you are halfway through and you think, “This wasn’t what I was expecting”, just send in an email and you will get all your money back. And do we ask you for reasons why? No, we just give you all your money back, it’s me, I promise. “But hey Jon, how about that thing that we are supposed to be listening to, instead of the old sales pitch?” Well hey, it’s my podcast, I do what I like. But let’s get back to that. Now this trick is actually based on Robbie Albert’s work and this was a kind of trick for cubicle workers to reduce their workload. Now of course they have bosses, cubicle workers, and employees have bosses, so this includes reporting to a boss. You don’t have a boss, probably and so you have to be responsible to yourself. However, it is not easy to be responsible to yourself when you have got no one to report to. So this is how this works. It is just two steps, two steps it does not take long. So Monday, assuming your week starts on a Monday; yes, I know you work for yourself so you have no weekends, you work Saturdays, you work Sundays and Monday to Friday doesn’t apply to you. Well hey, with this little trick we are going to get you back to Monday to Friday work. So on Monday, write down the tasks that you plan to finish by the end of the week. And by the way, this is every Monday and Monday morning before you start, quite obviously, before you start your working week. So when you are drinking that first cup of tea, or that first mug of coffee, do it then. So write down the tasks you plan to finish by the end of the week and then the tasks that you plan to be working on during the week that won’t finish, because obviously not everything finishes. Now this is important, do not jam-pack that schedule, this is not a To Do list, this is the things you think you can get done under the things you will start that will carry on into next week. There a fifty two weeks in a year, you do not have to get everything done this week. If you try, I know you think they’re all important and they need to be done, but if you try that is where you will get overwhelmed, that’s where it will all come to a grinding halt and nothing gets done. Let us give a little clarification, do not include every little tiny task. Don’t talk about opening the mail and having to go down to the bank or something like that, don’t include all those things. The other thing is base it on twenty hours. Now if you base it on what you think you might get done or you could get done in twenty hours, other stuff will happen, other stuff will come up. Some things will take a bit longer than you expect, we always underestimate things that’s why we are all overwhelmed and never get through everything. So that is the first part. Now, then of course you work and on Friday at the end of the day, so you need to set a time for doing this because you need to decide when the end of your day is on Friday. Remember, those employees, those people that get paid regularly every single month, don’t have to work weekends apart from the ones that do. The ones that work Monday to Friday, they finish maybe five o’clock, maybe half five, maybe four o’clock, whatever, they finish, they go home that is the end of the day, the end of the week for them. Try being like them. You didn’t plan to work all weekends and work all Friday night did you? Try and be like that. So Friday, set a time and at the end of that week look at the original list, write down the tasks that you completed and then write down the tasks that are rolling on into next week, and that is it. What you would do if you were the employee is you would have emailed that list at the beginning of the week, on the Monday, and then you would email them on Friday with the report at the end of the week and that’s why it is two steps. That’s it, what you plan to do at the start of the week and at the end, what you actually did. Now the cubicle employee’s job is to manage their own workload even though they have a boss and this reminds them that they are in charge of their own workload and that they can decide what they do and then they can prove to their boss that they did stuff that was worthwhile and they did stuff. Of course what happens if you finish everything that you had on the list from Monday? If you have finished everything on the list, this is very important, let me get this, let me say it slowly, if you have finished all the things you had on the list to be completed that week, you have done everything you wanted to accomplish that week, you do not have to find other things to do, your work is done. Give yourself a day off, give yourself some time off, go and spend it with the family, go out for the day, take them out, go and play golf, go and have a spa day, go and have a massage, go and get your hair done. I don’t care, but reward yourself and take time off. Your life as a business owner is going to be busy, you are going to overworked and overwhelmed for many years and all the years you have your business or until you do things like this, take the time to reward yourself. And that’s it, so remember if you finish great, rewards. There you go, simple tricks, this stuff works. By the way, yeah, this really does work, try it, don’t be so skeptical. 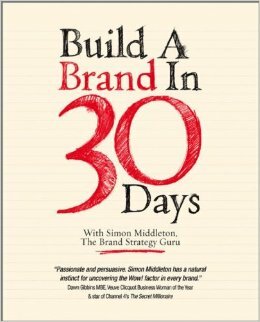 It is a Monday, episode 661, anything that ends with a”1” means it’s a Monday and time for book for the week and this has another one, Build a Brand in Thirty Days, something else to follow. This is by Simon Middleton and very simply, obviously it’s Build a Brand In Thirty Days, I think you can guess what it is going to be about. The book contains thirty exercises for thirty days, one exercise per day for thirty days. Do you think you could manage that? Do you? Thirty things, can you manage to do things for one month? And don’t forget if you read this, you can rope in, there are five things you need to do for the day or seven things over a week or whatever it is. Put them in this new trick see how it works out. Anyway, you will figure it out, it’s great. I’ll be back with some more simple tips and tricks tomorrow.